– Text by Joseph Quaye Amoo, freelance development journalist and youth activist from Accra, Ghana. This pothole made my week. 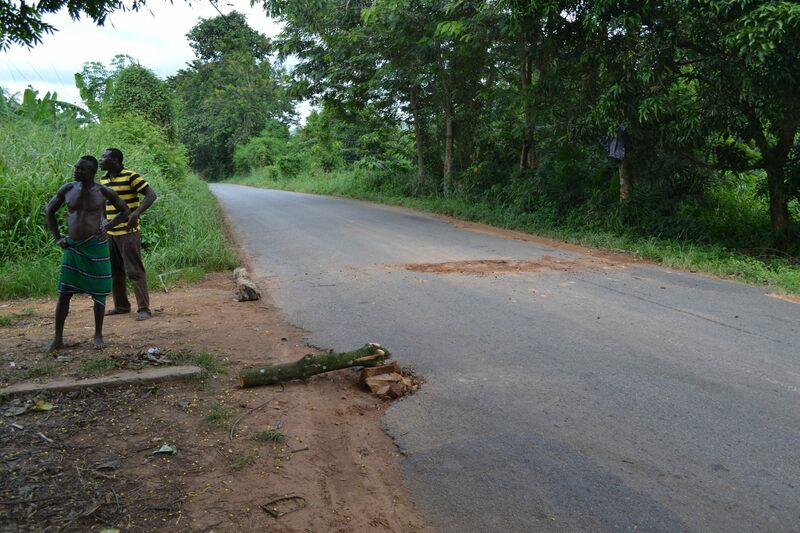 The pothole in the picture is in front of an entrance to a village near Koforidua. The young men of the village volunteered to fill it up because they saw the potential danger it could pose to them since that is the only bus stop they use. Vehicles dangerously hit the pothole because of the narrow nature of the road and also because it’s in a sharp curve surrounded by bushes. However, they were asking vehicles using the road for any amount of money they wish to donate. No driver gave any money. They stopped a driver of a Ghana Water Company mini bus and the driver told them he can’t pay because it’s a company car. The young men were angered by this. They quickly took their shovels again and dug out the filling. Some of the women pleaded with them to stop removing the filling. They still went ahead to unfill it. I stood silently in awe and observed what was happening. I felt the drivers were not obliged to give any money. I also felt the young men felt unduly ignored for their hard work and wanted to be thanked with money for solving a common problem – a problem that posed a risk to their community people as well as to the passing drivers. But a rather more important question came to mind: Who owns our development? Who is responsible for our own development?